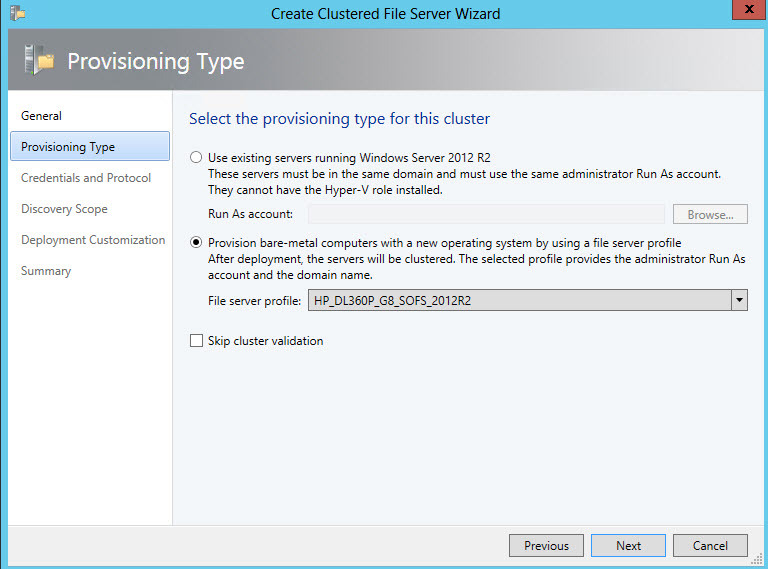 Today I wanted to share an awesome new feature of System Center 2012 R2 Virtual Machine Manager, which is the ability to bare-metal deploy your file servers and form the cluster to be used as a scale-out file server using System Center 2012 R2 – Virtual Machine Manager. 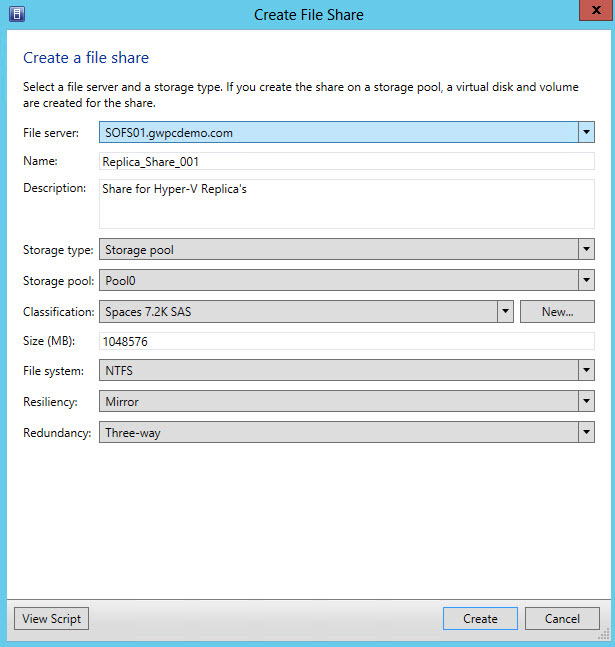 I also wanted to include how you can use SCVMM to manage your Scale-Out File Server and Storage Spaces such as creating storage Pools and shares. ### HP DS2700 (Direct Attached SAS Enclosure) For this lab I got a bundled HP D2700 that came with 10 x 1TB SAS drives. It is important to note that these drives are dual domain, if these were SATA drives (Single Domain) they would not work for this cluster configuration as both servers would not be able to use the drives over SAS simultaneously. 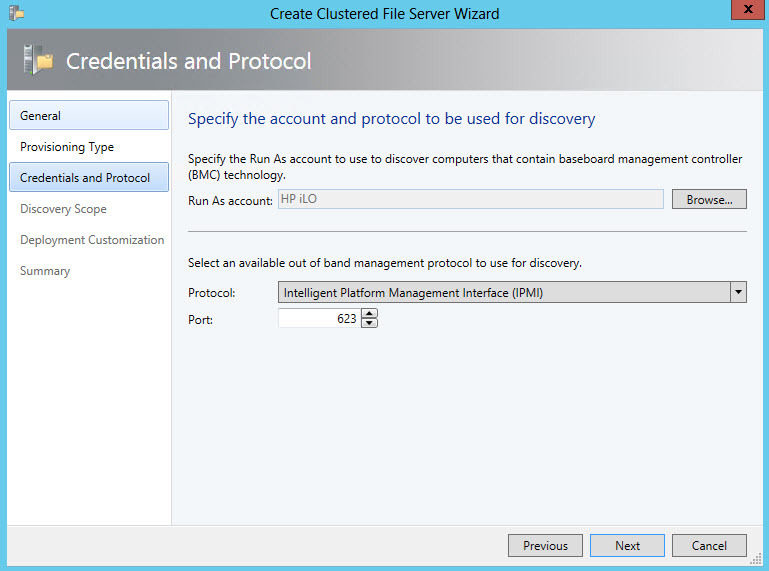 The following procedure is going to explain at a high level how to deploy your file server cluster using VMM. 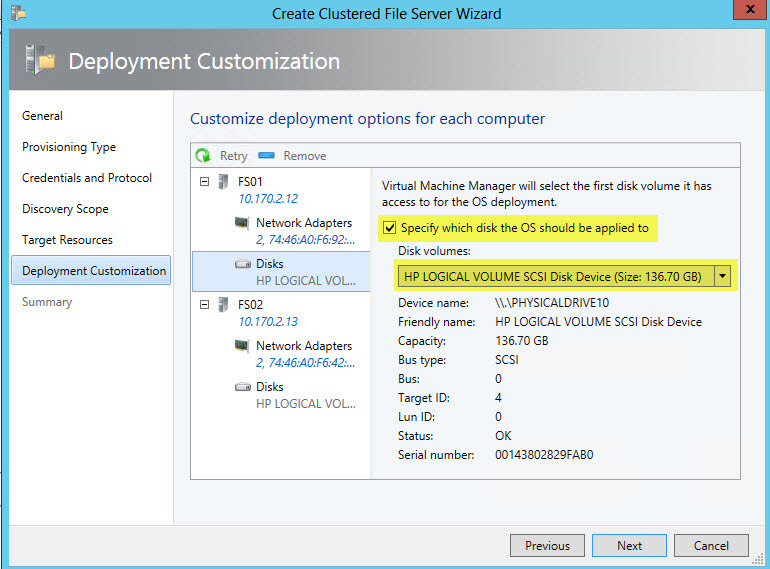 It should be noted that I am already assuming some familiarity with VMM and bare-metal deployment. 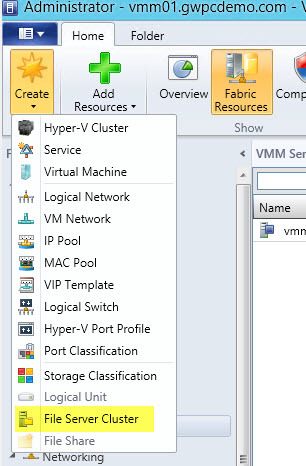 I also already have my VMM environment functional with a PXE server added to the fabric. 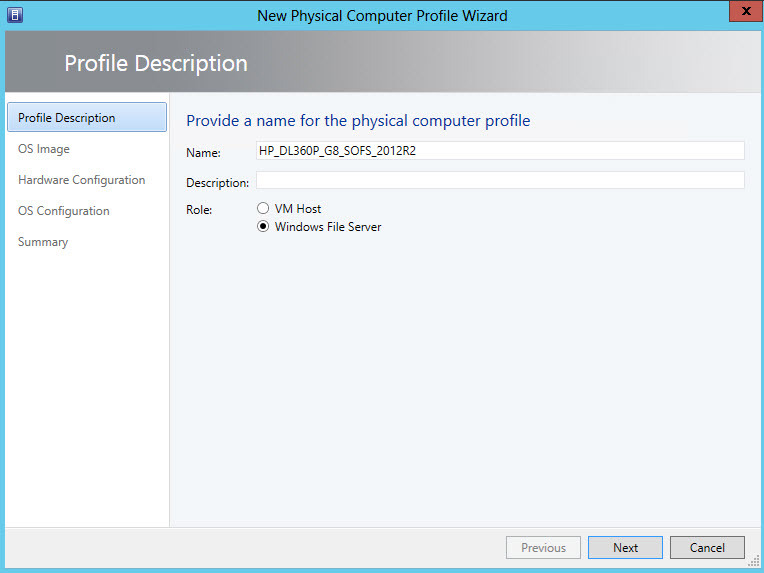 You will notice that in VMM 2012 R2 they got rid of Host Profiles and added Physical Computer Profiles instead. 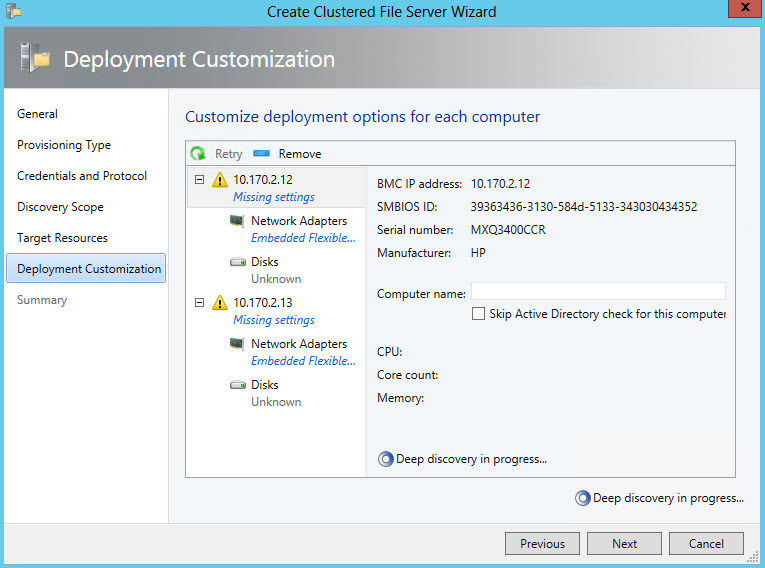 When you go to create one of these you will have the option of creating either a VM Host or a Windows File Server. 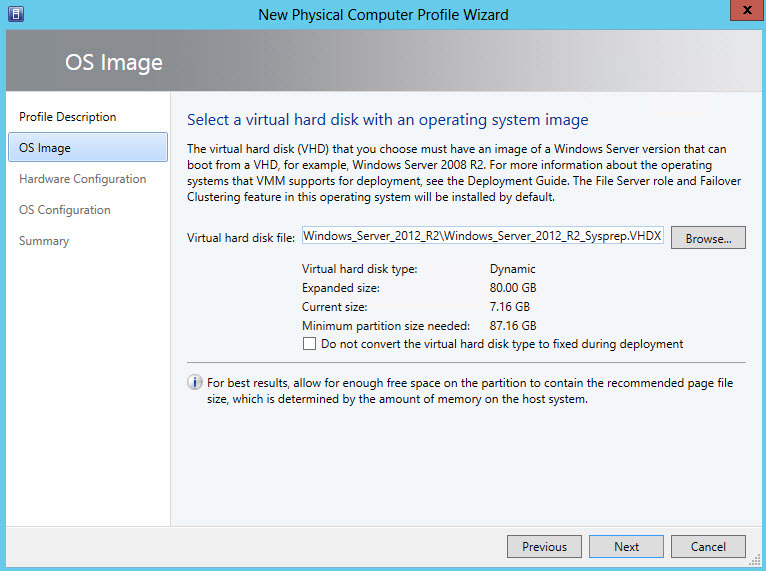 On the OS Image page of the New Physical Computer Profile Wizard you need to select your Server 2012 R2 VHDX file which this server will boot from, this should by a sysprepped native boot VHDX file. 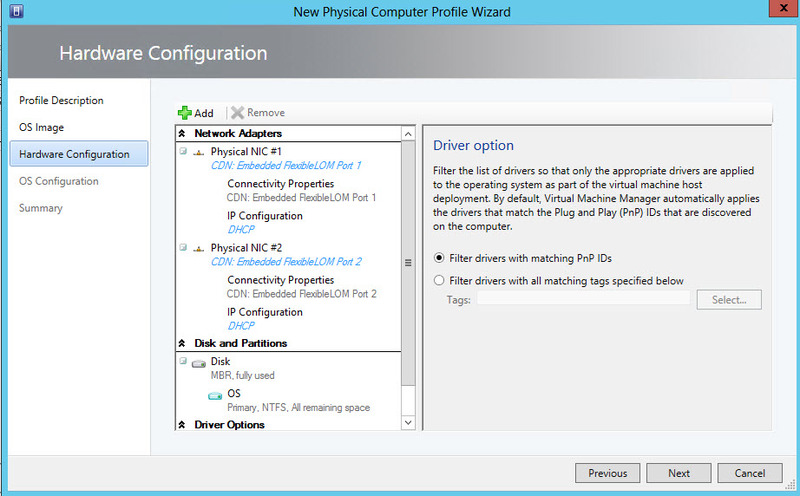 On the Hardware Configuration page of the New Physical Computer Profile Wizard you need to configure your network settings. In my particular case I added an additional Physical Network Adapter because my hosts will have two and I set the CDN (Consistent Device Name) for each of these NICs. I am also leaving my NICs on DHCP for the purposes of demonstrating this technology. 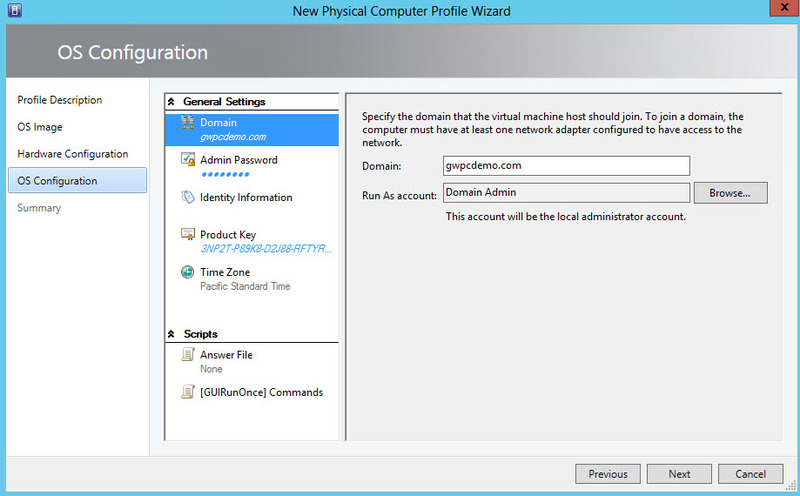 On the OS Configuration page you need to specify the domain you wish to join, a Run As account with permissions to join computers to the domain, Time Zone, Product Key etc. 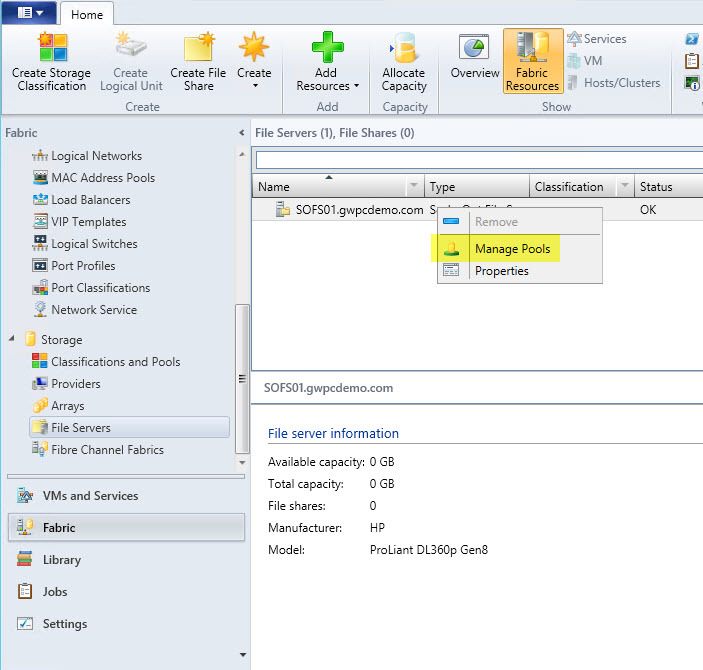 On the Summary page review your settings and click finish, that is as simple as it is to create the Physical Computer Profile for a file server. It should be noted that I already have my servers cabled up, along with the Shared SAS enclosure before deployment. I have also configured my servers to PXE boot first in the boot order. 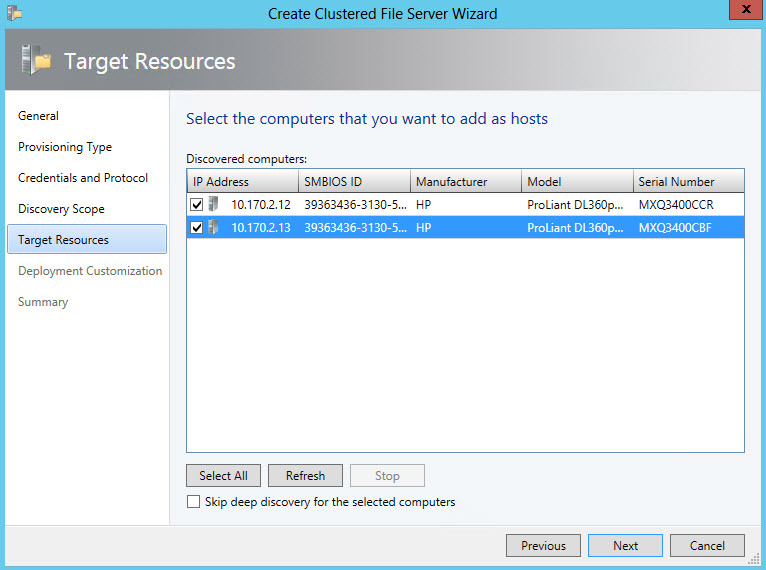 On the General page of the Create Clustered File Server Wizard you need to enter the Cluster name and the File server name. 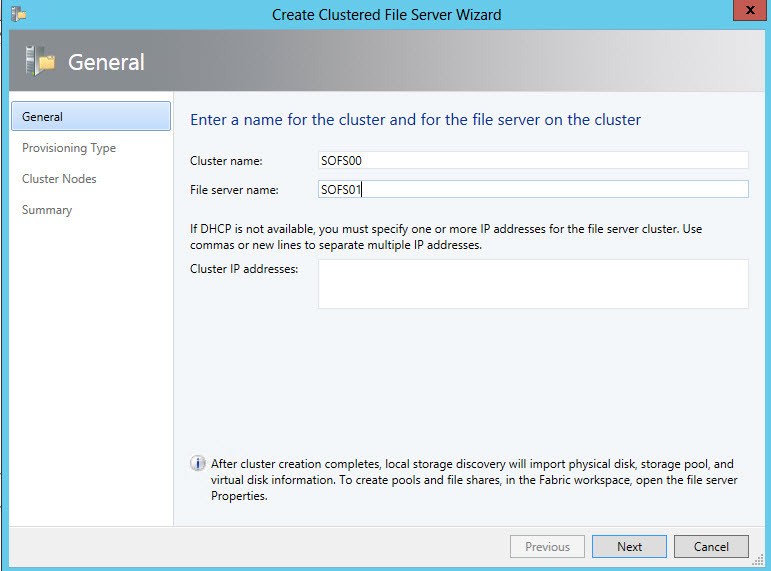 The cluster name will wind up being the core cluster name while the File Server Name will wind up being the Scale-outFile Server Cluster role deployed on the cluster. In this case I am leaving my cluster IP on DHCP. On the Discovery Scope page I am going to enter the IP range containing the iLO addresses for my two physical hosts and hit next. It should be noted that this will cause an immediate cycle of the machine if it was already running, in my case these servers are turned off and this will wake them up to PXE boot. 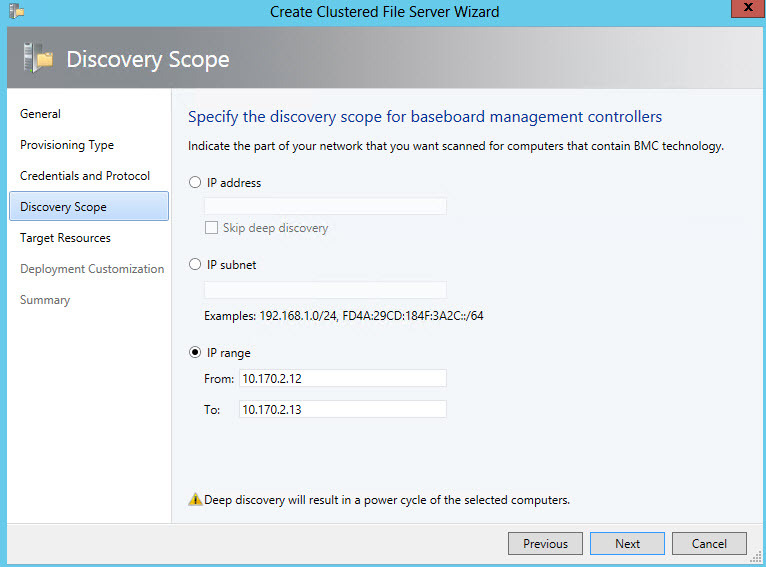 On the Target Resources page VMM is going to display the BMC’s it found it the given range from the previously defined *Discovery Scope, *in my case I am going to select the two computers and click Next which is going to start the discovery process. At this point VMM is going to tell these computer to boot, when they attempt to PXE boot these servers are going to be served a WinPE image which contains the VMM agent, this will then do a discovery on the physical components of the computer which will allow us to customize the deployment to the discovered hardware. 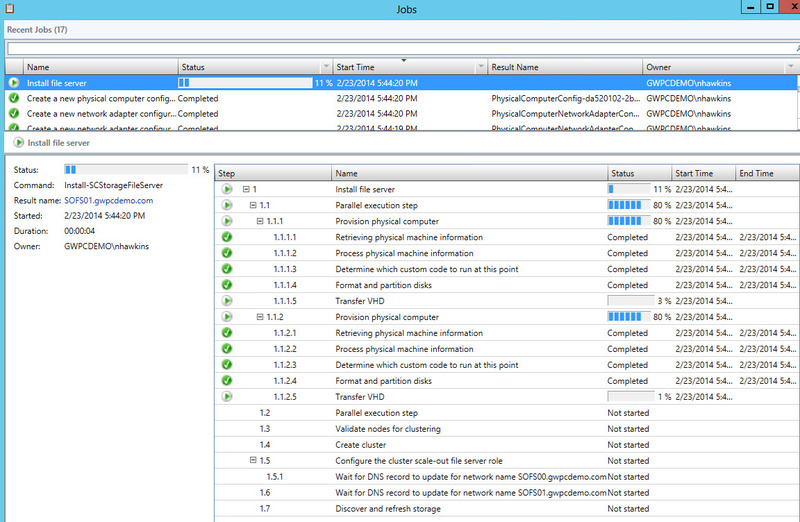 On the Deployment Customization page you will need to wait until the Deep Discovery finishes as indicated by the spinning circles with the text displaying “Deep discovery in progress…” Once this completes we can enter the computer names, be sure the OS is detecting to install to the proper disk, and be sure each of the network adapters we defined with CDN were properly discovered. In my particular case I needed to check the box for “Specify which disk the OS should be applied to” along with selecting the internal disks because the discovery detected all of the disks in the SAS enclosure and would have attempted to install there. Once this is all validated click Next. On the Summary page review your deployment settings and click Finish to start your awesome deployment! Review to the VMM jobs view to watch all the awesome stuff that is going on in the background. In my particular environment my File Server Nodes were deployed and the cluster was created in 37 minutes. The job did complete with warnings around the cluster validation tests it performed, it will include a link to the cluster report so you can review the cluster validation report. In my particular case I had warnings because I have two interfaces on each server on the same subnet which is not recommended – This is just for demonstration purposes and in production I would put these on two different networks. With this Scale-Out File Server I am going the way of storage spaces, the 10 1TB disks in the SAS enclosure are currently JBOD so we can go ahead and pool these disks. Once the Manage Pools of File Server window opens you can observe that there are currently not any pools on this server. We can then click New to create a new pool. 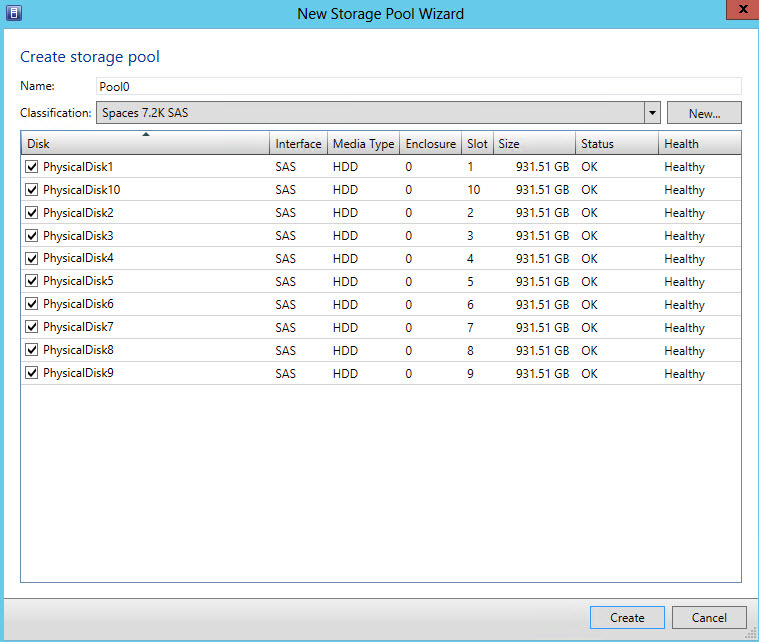 Once the New Storage Pool Wizard opens I can give my Pool a Name, create or use an existing Storage classification and finally select all of the disks I want to use for this pool. In my case my SAS enclosure has 10x 1TB 7.2K SAS drives which I am going to use for my Pool. 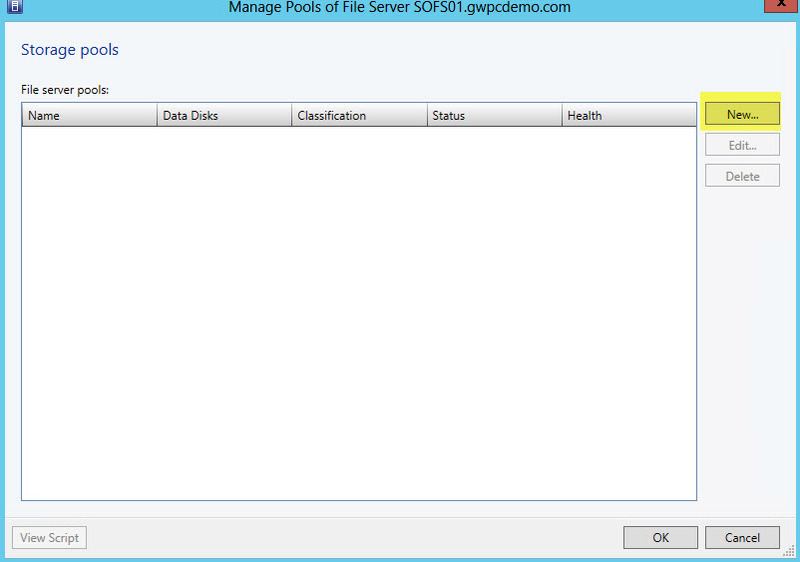 Now that we have our pool defined we can move right into create File Shares on our SOFS server using our storage Pool. 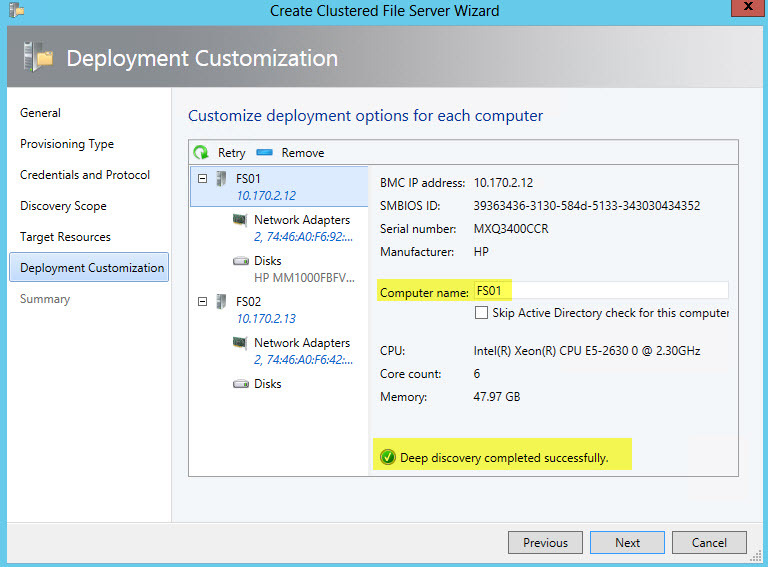 Once the Create File Share wizard comes up we can give our share a Name, Description, define the Storage Pool we are going to use, select the previously created Classification set the Size in MB (this is for a 1TB share) and finally set the resiliency of the share, this one will be a 3-way mirror – This is the part where we are actually creating a space on the Pool of disks! It should be noted that there are some optimizations that should be made on your SOFS cluster to take advantage of SMB Multichannel, RDMA etc. These settings are not optimized by SCVMM during deployment so there may be some messaging required after deployment for production deployments. The good thing here is the bulk of the deployment has been done for you. 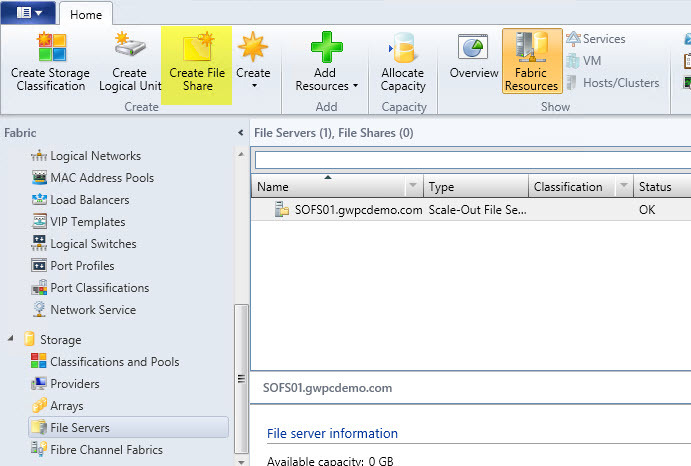 You now hopefully have a better idea of the capabilities SCVMM 2012 R2 has to offer when it comes to deploying and managing Scale-Out File Servers and Storage Spaces. Hopefully I will continue with some content on this subject in future posts.